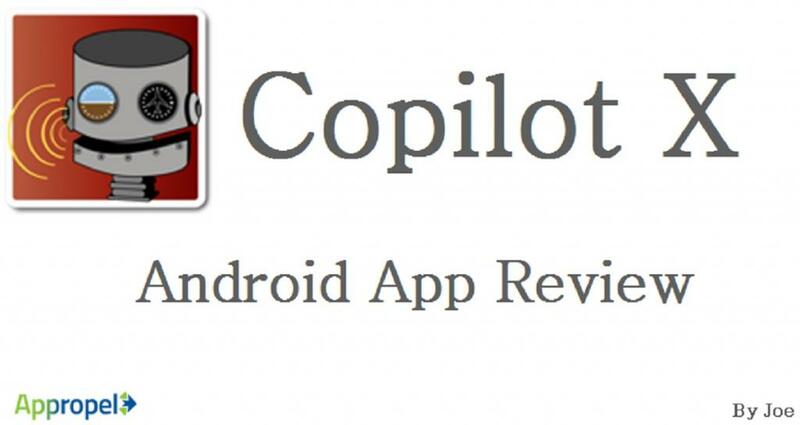 Copilot X can be found on the Google Play Store and is one of few x-plane apps available. This app uses your phone as a microphone to give commands to the sim. You simply touch and hold the screen and speak, the app will then turn this into a command telling x-plane what to do. For example if I said 'flaps down' the sim will then lower the flaps in the aircraft I am using. It's basically a virtual copilot! So I downloaded the app and gave it a try! 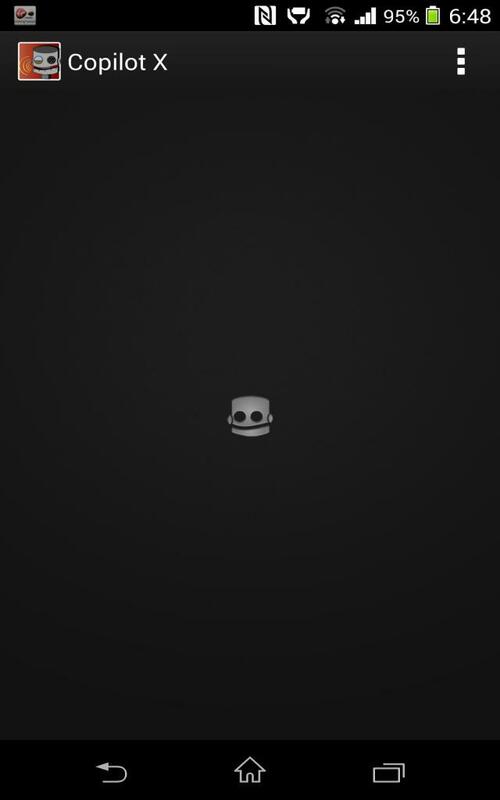 I first started up the app to see literally a blank screen, but I was expecting that as had seen pictures previously. The whole screen becomes a button which is held when you speak into the phone, this is a good feature as you do not need to look at your mobile device to check what button your checking. The colour scheme is very dull however I suppose your going to be focused on flying! There is also one other button at the top of the screen to the right. This is options/settings, so its pretty simple to navigate the app. The settings menu also uses the colours set by you, from the pictures you can see that the bars are blue, this is set in my phone settings. The menu screen is a scroll screen, so its easy to use. The in-app graphics was designed by a graphic designer and not the main developer himself. 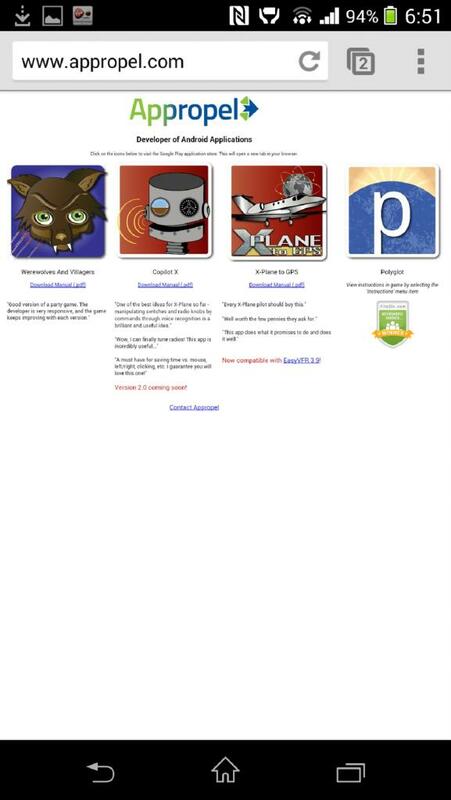 Well I can say that the graphic designer done a good job as the icons and animations look good and go well together. 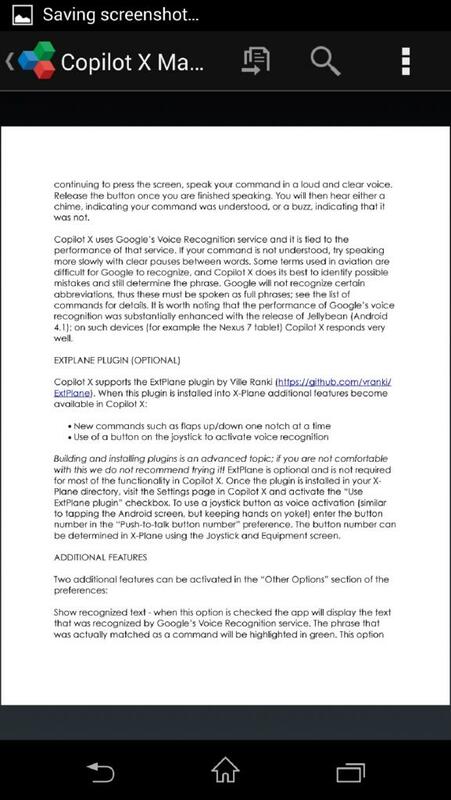 I especially like the robot face that lights up when voice recognition is activated, this robot head also matches the app icon.
. Read Back Commands - The phone will read back commands that you give, a virtual co-pilot! So with my settings configured it was time to give a command. I started first with "Battery On" . It worked perfectly and the battery switch in my Cirrus jet turned on. 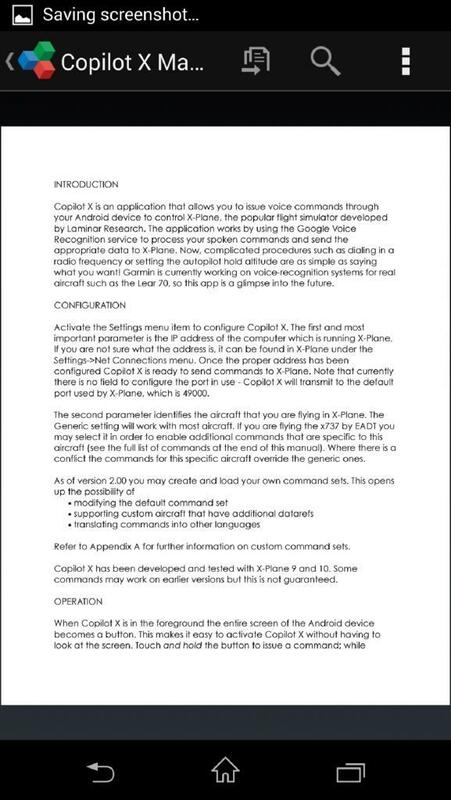 The second command was "Beacon on" however at the time is was holding the phone and as it automatically went into landscape mode the button holding disabled. Any how I proceeded with more commands that all worked great and fast. So does it recognise your voice perfectly? The simple answer is no. You have to speak clear and loud for the app to detect your voice. This is because the app uses the built in speech recogniser, which works ok and good enough for what the app needs. It would be brilliant if you could plug in a microphone/headset into the phone and therefore use Vatsim at the same time, but that's nothing to do with what the developer can do. This app has some functions which are needed such as the ones listed in bold above but it feels a bit plain. It would be great to see this app grow so it matches something like FS2Crew. But comparing prices, this app only costs you £2.42! Also It would be great if the voice read back sounded like a real human therefore simulating a virtual co-pilot. But I am sure that this app will grow great over time. The push to talk button feature is great! I assigned it to my pro flight yoke, and I then didn't have to even touch my phone! This feature also works pretty well, it certainly adds ease of use because touch/holding the screen can distract me from flying. Now we move onto analysing different features that are highlighted in bold above. As you can see that's a massive range of commands that are accepted, and that's only on the generic setting. When set to x737 (which is in the menu default) you get a ton more commands, for example precision control when using the flaps. 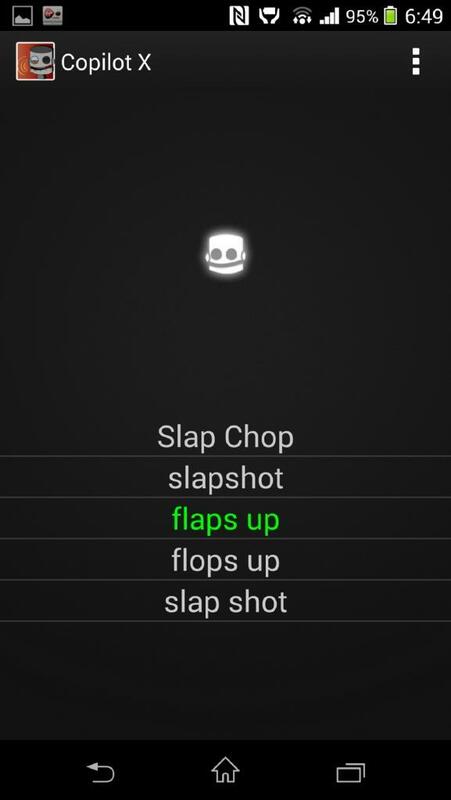 You get a more wide range of commands rather than "flaps full" you get "Flaps 01/02/05/10/15/20/25/30/35/40". Obviously I didn't get a chance to try every single command but I had the opportunity to try most of them. When doing this I realised that lots of pressure is taken off from you as the captain, this is because your virtual co-pilot is doing all of the work! However I did notice that you cannot get away with speaking casually. For example if I said "turn on the generator" as if I was speaking to a close to life co-pilot it would not be recognised. You have to say the exact command, but I suppose its not a problem as nothing in the flight simulator world will do this. Even in FS2Crew for FSX you still have to say commands which match the criteria that's been programmed. Plugin: As you can see from above there is an option to activate an External Plugin which increases the amount functionality the app has. 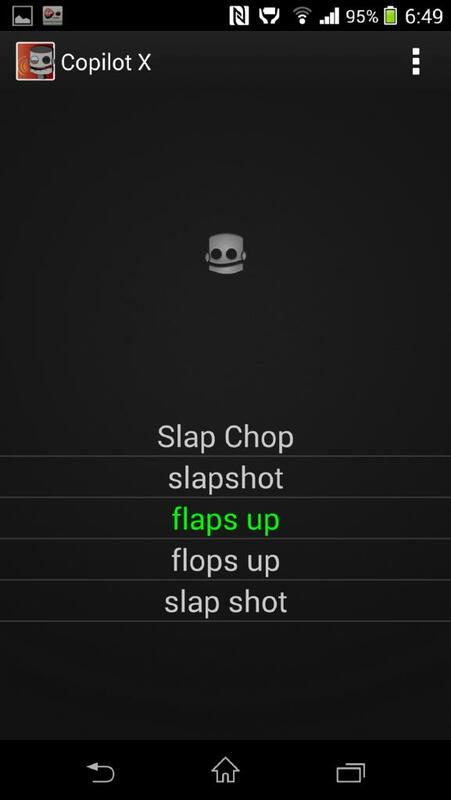 For example the extra plugin enables more commands such as "Flaps up a notch". The extra plugin is worth downloading, and it's simple. Just simply download it and drop it into your plugins folder! The plugin also gives you the ability to assign a joystick button for push to talk which was described briefly in the above paragraph. 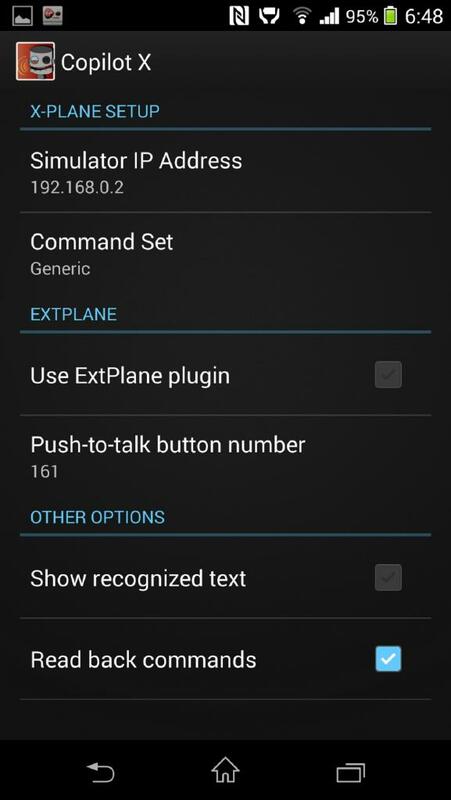 So overall the plugin is worth downloading as the push to talk feature and extra commands just adds more to the app. It would also be great if the assignment option for push to talk would automatically pick up the button when you press it, the same way when assigning button functionality in the x-plane menu's, but its still easy to assign a button the way it currently works. Apart from that the plugin doesn't actually do much else. The developer did comment though that he wishes to gain a community for Copilot X and therefore many people can gather together and make more plugins. I think that its a great idea and will only make the app even better! Show Recognised Text: This feature will display a result of five results of what it thought you said. The correct command that it recognises will display green. Its a good feature because it gives you reassurance that the command was picked up properly, although you could say it takes up screen space that is used to press and hold to speak. However this will not be a problem if you have a joystick button assigned. Pictures of this can be seen below. 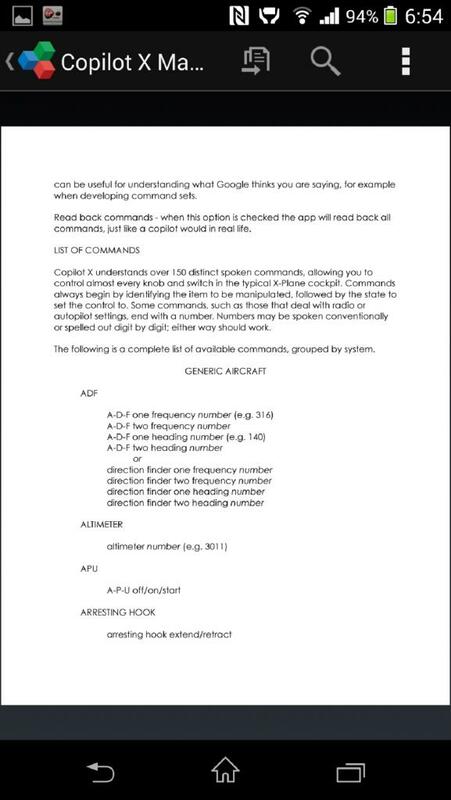 Read Back Commands: This feature speaks back commands that you give it. Its basically a virtual co-pilot. The "virtual co-pilot" is a computerised voice which for me is not life like. In the future it would be great to hear a more realistic voice such as a recorded humans voice, with the option for male or female. Also when the app reads back the commands the computer voice speaks through the phone which is a nice feature because it adds to the 3D sound immersion that you get in x-plane. Manual: The manual included is very detailed and explains everything that you need to know. Its well designed and is easy to read and use. I had to refer to the manual when I started it up for the first time, after reading the manual my problems were solved. The only issue I have with the manual is that it the command list can become unclear after scrolling through many pages, but its nothing to complain about as it has all of the information that you will need. The sounds are great with this app as they are easily recognisable. 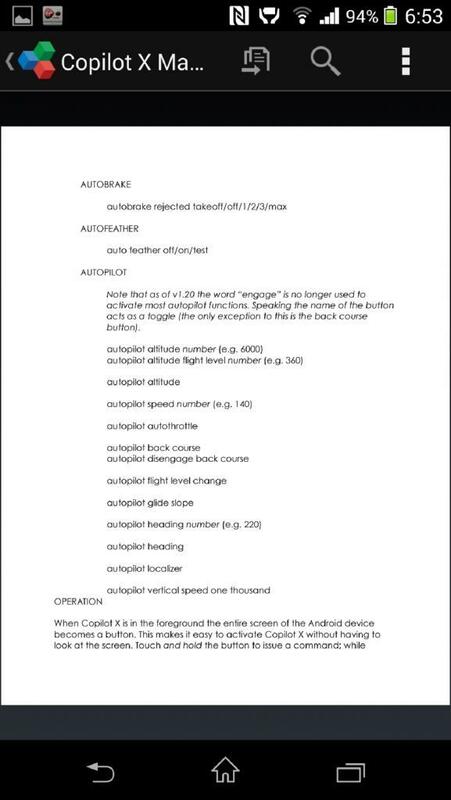 For example when you say a command into Copilot X if it gets recognised it will play a bright and happy "ding" noise. If the command is not recognised you will hear a dim and low in pitch screech noise to warn you. Personally I have no problem with these sounds as if you don't want to hear them you can just mute the phone/tablet. 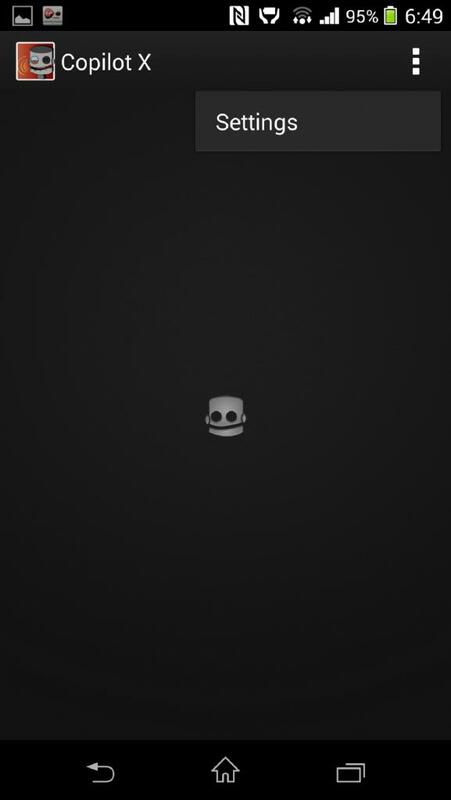 Other sounds include the sound pack for "read back commands", like I said above I don't really like the computerised voice, hopefully this can be changed in the future. For me the whole point of this app is a virtual co-pilot, this would be great if Copilot X could speak back commands in a real pre-recorded voice, and even the option to select male/female! However the app is only £2.42, so you have to be considerate of what you will get. Is there a team developing the app, or was it done solo? I am the sole developer. I hire a graphic designer for icons, in-game graphics, promotional materials, etc.. I am a licensed pilot and I have previously worked on ATC research... Flight Simulation is a big area of interest for me. What inspired you to make the application, was it a link with real aviation? It was a case of putting two things together in my mind. 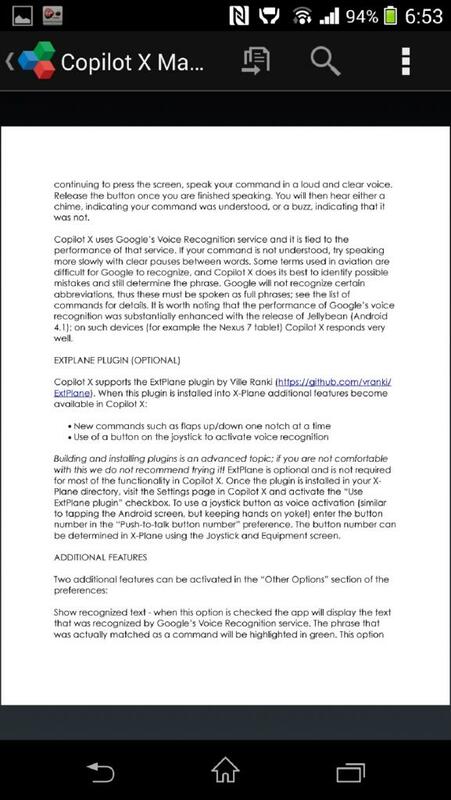 When I was reading about Google's Voice Recognition service I realized that I could use it to translate commands into something that x-plane could understand. I figured it could ease the pain of putting numbers into the radio's. autopilot, etc.. and that has indeed proven to be one of its greatest strengths. What is unique about the app you built? I've seen few other solutions that offer voice recognition for x-plane. As far as I know this is the cheapest, easiest solution- just load it onto your phone/tablet and go! With the growing number of Apple IPhone users, why did you make the decision to build the app for Android? I am strictly an Android developer as I favour the open ecosystem over Apple's "walled garden". Voice recognition is now built into the Android Platform so it served my needs very well. How long did it take you to get the app where it is now? The initial version came out in June of 2012, so its been close to two years. I just released version 2.0 which is a major rewrite allowing the user to develop their own custom command sets. This enables users to change the commands to suit their preference, support custom aircraft, and even translate the command set into other languages. 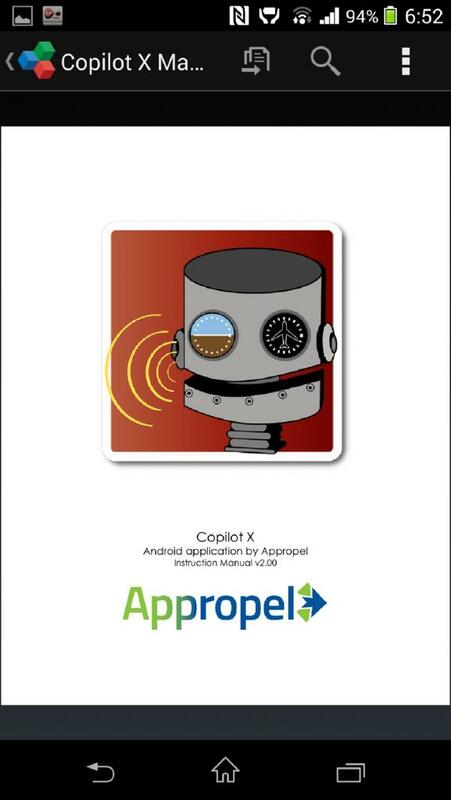 What are your future plans regarding the development of Copilot X? Now that version 2.0is released I plan to work on more command sets to support custom aircraft and other languages. I'm hoping that the Copilot X user community will chip in here. I just found out about the great new Garmin 430 that will included in x-plane 10.30, and I will be researching to see if I can connect with it. The number one feature I've wanted to do is to be able to programme the GPS and FMS using voice commands, which has been impossible to do because x-plane does not adequately support it. Can we expect future app builds? Are there any examples? I will continue developing Copilot X as long as people are interested in using it. Support for GPS/FMS and ATC are two areas for future development. I'm hoping that more people find out about this app and the community grows..... It's really like magic when you watch x-plane respond to you spoken commands! Can you explain about your other apps, such as X-plane to GPS? Overall I would give this app 4/5 stars. This is because it functions properly and the way it should, however it would get the full five stars when many more features are added. But that doesn't mean its not worth getting! I would really recommend it if you have trouble controlling knobs and switches in the cockpit, as the app will do it for you making flying more easier. Also it is pretty cool being able to speak into your phone or tablet and for it to translate your voice into x-plane commands! This app deserves much more recognition, more than what it currently gets! Another constraint that I didn't mention above is the lack of the app on Apple's IOS, but the developer clearly states in the interview that he is strictly an Android Developer. But is suppose that many people own an Android device now, despite Apple's IPad or IPhone being more popular its not too much of a problem that this app is for Android. So, Yes its worth buying! For a cheap price this app is very good, I am glad I found it on the Android store! it was a small review but being an App there is not a great deal to comment on, nether the less this app is worth having on either a phone or a tablet. The v2.0 update is free to anyone who already owns the app.